At Neal Urban Studio we love to do come up with ideas for different kinds of photo sessions. We have families that tell us their vision and we bring them to life. We did this families wedding portraits, first baby newborn, first birthday photos, family portraits, christmas portraits, and now their second baby newborn. Mom really wanted to have their first daughter in some of the photos. She also wanted to use her wedding dress. We thought this was such a cute idea! This little newborn good was such a good sleeper. She was in such a deep sleep here. We had the idea to have big sister get into the wedding dress. Then we dropped the trains over a basket to lay the newborn girl in. She was dressed in a pink flowered diaper cover and flower headband. 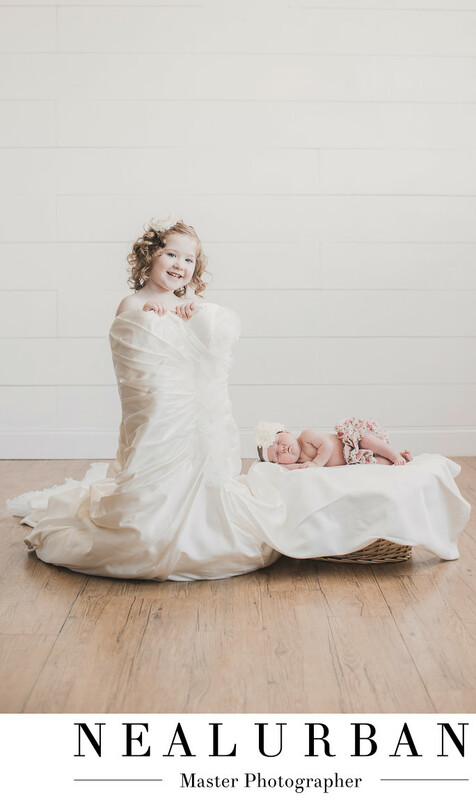 The funny part of this story, is the big sister was afraid to step into mom's wedding dress. We told her it was a princess dress. Then dad put his foot in and she followed suit. Once she was in the dress, we placed the baby down. We already had an idea of how we wanted her. Then had her sister hold up the top of the dress! It was so cute. We loved the expression of the big sister. She is just adorable. We really liked how mom wanted to incorporate her wedding dress. Girls no longer wear their mothers wedding dresses like they used to. So at least, we were able to do this for her daughters!